It’s a statement we often hear about the 2001 Miami Hurricanes, both by fans, and the media members who cover college football as well. But after hearing it earlier this year, a light-bulb went off in my head: Just about everyone seems to have an opinion the 2001 ‘Canes, except Miami’s former players and coaches themselves. And from there, another thought immediately popped into my head: What if I tracked down as many Hurricanes players and coaches from that 2001 season as I could, interviewed them, and asked what they thought about their team, and where they rank in college football history. Well, six months later, the answer was “spectacular” and after collecting interviews with roughly 50 former players and coaches, an article, the definitive article on the greatest team in the history of college football will run on FoxSports.com on Wednesday. If you’re a ‘Canes fan (which I have to imagine you are if you’re reading this website), I can promise you that you can enjoy the article. But here’s the thing: During the process of reporting the article, I learned that I wasn’t the only one who shared the same passion for the 2001 ‘Canes. As it turned out, one of the former players I interviewed, Najeh Davenport, also shared that passion, and like me wanted to tell the world his team’s story. Najeh recently released a documentary about the team, titled ‘The U: Reloaded’ which premiered last month. Through Najeh, I met his business partner Platon, who runs things here at ProCanes.com. And it was through my friendship with Platon, that we’ve decided to give Miami fans a treat. Before the article runs in full on Wednesday, Platon was nice enough to offer up his space here on proCanes.com, to run an excerpt. It’s a treat for all you diehard ‘Canes fans, and proCanes is the only place that you can read this exclusive excerpt. Of course the article will still run in its entirety Wednesday, and if you enjoy what you read here, be sure to check out the article on FoxSports.com. You can also follow on Twitter @Aaron_Torres, where I’ll post the link once it goes live. In the meantime, enjoy this excerpt from the article…. In the excerpt, we pick things up shortly after Larry Coker was hired as head coach, as the team prepared for the 2001 season. As you’ll learn however, it really didn’t matter who the Hurricanes had hired as head coach. The team was not going to be denied the title that had eluded them the year before. Again, enjoy and be sure to look for the full article on Wednesday. The final, and arguably most important piece to the 2001 team was set: Miami had its head coach. Now it was time to get to work. A team that had been denied a shot at a National Championship the season before, was not going to allow that to happen again. Joaquin Gonzalez (senior, offensive tackle): The one thing I remember going into 2001 was, Larry Coker and his staff, as well as the players decided that we weren’t going to leave the decision on who plays for the championship on anyone else’s plate but our own. Brett Romberg (junior, center): (Our mindset was) ‘This year it ain’t gonna be decided on a poll or whatever kind of computer analysis.’ We were worked up, ready to get back at it. D.J. Williams (sophomore, linebacker): It was great to be there with Butch, but when he left our plan didn’t change. Brett Romberg (junior, center): We were anxious to get back at it. We didn’t want downtime. Usually you’re excited to get back home, brag ‘We just won the Sugar Bowl’ but we didn’t want that. We were like, ‘Let’s get back in the weight room, and get after it. 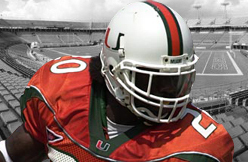 Ed Reed (senior, safety): When we got back to Miami to start spring football … my God. That spring before that National Championship year, those off-season workouts, it was like no other in the world. Andreu Swasey (strength and conditioning coach): That was our DNA (to work hard). That is part of our system. It wasn’t talent-driven, it was work-ethic driven. Mike Rumph (senior, cornerback): I don’t feel like we get ever get credit for our work ethic. 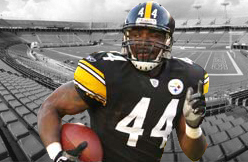 I played six years in the NFL and the hardest I ever worked was at Miami. Those summers were treacherous. Frank Gore (freshman, running back): My first day I get there, we were doing agilities with the linebackers; I’m competing with Chris Campbell, God rest his soul, and I’m like ‘Man, I think I made the wrong decision.’ I’m the top (high school) running back, how is a linebacker beating me in agilities? Clinton Portis (junior, running back): We competed in everything! We all wanted to be the fastest player, we all wanted to be the best basketball player, we all wanted to be the highest jumper, we all wanted to be the best at everything we did. Antrel Rolle (freshman, cornerback): The way we practiced, it was insane. I’ll be honest with you, it was literally insane. You would think that we did not like each other, on the field, off the field. Mike Rumph (senior, cornerback): It was just a machine. It was a machine but we were just so afraid to have failure. Curtis Johnson (wide receivers coach): Andreu Swasey said this all the time: The players were always around. They were always around us, always around the office. It’d be Friday night, Saturday morning, they’d be around, they’d want to want watch more film, and we couldn’t get rid of these guys for nothing. Their whole lives revolved around this little football team. Mike Rumph (senior, cornerback): People didn’t see the Saturdays where we met up as a team (in the off-season). Or the meetings we’d have 6 in the morning, where there were no coaches there. Brett Romberg (junior, center): Saturday morning at 8:00 a.m., no matter how hung-over you were, you are in the field. Brett Romberg (junior, center): Granted, you didn’t have to be there. At any other school a guy might show up at 8:05 with his shoes untied or something. Not at Miami. No, if you didn’t show up at 7:55 ready to go, you got shunned. Nobody wants to talk to you, because you think you’re so much bigger than the group. There were never any egos. Mark Stoops (defensive backs coach): They did seven-on-seven with each other, the o-line and d-line worked basically the whole year round. That’s just what they did; it was part of their culture… I was blown away by the player’s self-motivation and how great the leaders were there. Don Soldinger (running backs coach): One time, Frank Gore called me at 3:30 a.m. to ask me about pass protections. Frank Gore (freshman, running back): He said ‘If you need help, don’t be afraid to call.’ So I was studying my plays and I called him and told him to quiz me. Andreu Swasey (strength and conditioning coach): Who stood out as leaders and workers from that group? Can I say ‘The team?’ I had so many guys. Curtis Johnson (wide receivers coach): It started during 2000, but the players, they really policed themselves. We had no altercations, we had no nothing. D.J. Williams (sophomore, linebacker): As far as punishment, that was all done within the locker room. Phillip Buchanon (junior, cornerback): The coaches aren’t gonna handle this. This is our locker room. We’re going to handle this. 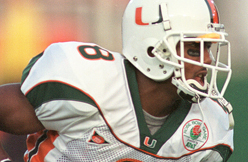 Curtis Johnson (wide receivers coach): I remember, Sean Taylor was a freshman and I was watching him right at the beginning of two-a-days and Sean, he just didn’t run (as) fast (as he could) or something. And the coach went to get on him, and before the coach could get there Ed Reed just jumped on him; Sean was almost crying. It was the worst thing you could ever see, but the coaches didn’t have to do any of that, the players did it all. When that happens, I knew we were well on our way. Najeh Davenport (senior, fullback): This may seem bad to say, but my senior year, Coach Coker was the head coach, Coach Chud was the offensive coordinator, but once we learned the system, that’s all she wrote. Maurice Sikes (sophomore, safety): (Coker) knew how great of a team he had. He had been there with us. We had great leadership on our team, we had great coaches, great assistants, great starters, great back-ups. We knew what we had, and knew we didn’t need much tinkering. Brett Romberg (junior, center): Butch Davis had done a great job steering that ship and doing a great job in building it, and all we needed was somebody to maintain the animal. Coker was the perfect fit. Maurice Sikes (sophomore, safety): He had a very good understanding of the fact that he had a masterpiece. All he had to do was take it to the damn museum. Najeh Davenport (senior, fullback): We were teaching each other, coaching each other, watching film together. We were destined to win the National Championship. Randy Shannon (defensive coordinator): I felt like we had a bunch of guys who had a common goal. They wanted to win a championship. Aaron is a contributor at FoxSports.com. You can follow him on Twitter @Aaron_Torres, and be sure to check FoxSports.com for the full article on Wednesday.